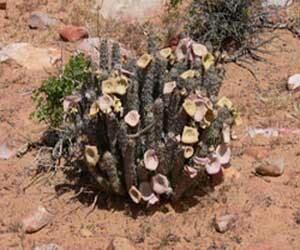 Hoodia is known as kalahari cactus and xhoba. It is a cactus-like, flowering plant indigenous to South africa, it grows in the Kalahari Desert. The harvest is protected under conservation rules. The Bushmen have been eating xhoba to lessen their thirst and hunger during long hunts for centuries. Today, xhoba is used for weight loss. The dried extracts of xhoba roots and stems are used to create powders, chewable tablets, and capsules. It can also be employed in teas and liquid extracts. kalahari cactus products often have minerals or herbs like chromium picolinate or green tea. In 1977 the CSIR (South African Council for Scientific and Industrial Research) isolated a ingredient in xhoba. This ingredient is called P57. It is responsible for the appetite-suppressant effect. A study published in September 2004 in the Brain Research issue found that p57 injections into the appetite core of rat brains had resulted in changed levels of ATP. ATP is an molecule that could affect hunger. Animals that received the P57 injections in addition ate less than the rats that had received placebo injections. This study cannot be used as proof that xhoba is an appetite suppressant because it was a animal study and brain injections are not the same as oral consumption. My opinion: xhoba taken in its purest form does work as appetite suppressant. The san bushman used it for just that reason. The safety of xhobia is unknown. The side effects, potential risks, as well as interactions with supplements and medicine have not been scrutinized.